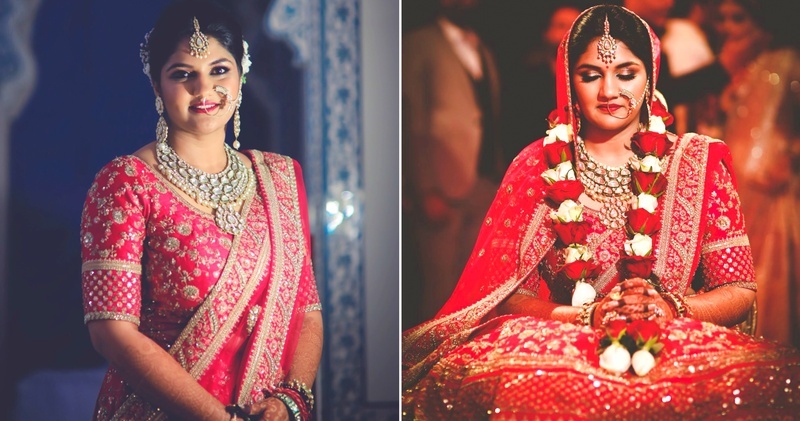 Flaunt your curves in style - 10 lehenga styling tips for the curvy brides! Happy brides are the prettiest, and it doesn’t matter whether you are curvy, tall, short or skinny. Having said that, now let’s focus on the styling part - because every body type is different, and needs to be styled accordingly. Fabrics like satin, georgette, crepe or even pure silk work very good for your body-type! On that note, actually anything that’s lightweight will look good on you. Just stay away from fabrics like chiffon and lycra as they stick to your skin, making you appear larger than you are. If you have a slight belly, then opt for a high-waisted lehenga. Tie the lehenga skirt above your navel area, or camouflage the visible belly with a belt! Also, make sure that your choli ends just an inch above your lehenga. It will hide any bulges that you may be conscious of. A little less confident about your arms? Go for ¾ th sleeves while picking your lehenga/saree! This will make your arms look slimmer and well-toned! Also, a lot of designers go for ¾ th sleeves to give that elegant and royal look to your bridal look! Large motifs and prints on the lehenga can add a lot of unnecessary bulk to the to your body. They will make you appear more broad & large, which would definitely not help in your case. So go for smaller prints and motifs that are evenly scattered around your outfit. Try to stay away from deep plunging necklines! V necks and square shaped necklines usually work best for curvy brides. Also, we recommend avoiding boat necks if you have large shoulders, as they’ll only accentuate them further. High-contrast colours make it hard to create a distinct shape for the body. You should go for darker colours like plums, greens and black instead and definitely don’t be afraid to wear pastels! Pastels are really great choices when you want to define your silhouette. Fish-cut lehengas tend to highlight your curves and not in a good way! So, instead opt for an A-line or an umbrella cut, which create a more flattering shape, and bring attention to your best features. Pick one colour for your entire outfit, and if you want to opt for a contrasting look, then opt for two shades of the same colour. Doing this will give you an even look from top to bottom, creating the illusion of a slimmer waist and a taller frame. Draping your dupatta in a certain way, will easily take away a few kilos from your bridal look. So, just tuck in your dupatta on one side of your waist, and drape it neatly around your waist and over your shoulder, exactly like a saree. This is a great way to cover your belly (if you want to!). You can opt for the double dupatta trend bringing more drama to your bridal look. The front pallu dupatta look is definitely not your style! Everybody loves chokers right? The problem with them chokers is that they don’t work for all body types. Anything that sticks to your neck closer to your face, will make your face appear larger. So opt for multi-layered or statement necklaces which’ll look better than the chokers! All this being said, always remember that you should wear what you feel most comfortable in and own your wedding like it’s nobody’s business!